Our Barn rental offers everything you need for your event. Included are an iPod, mp3 player and CD player accessible 800 watt sound system. Our 2400 square foot indoor reception hall will seat 150 guests. We also have a stage, dance floor, on-staff bartender and security guard for your convenience and safety. There’s lots of parking, handicap accessibility, dance lessons and much more! We can accommodate both indoor and outdoor events. Contact us today for information on availability and reservations. 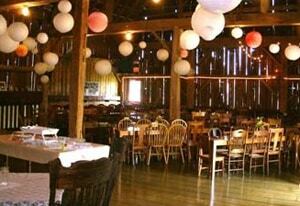 Be sure to visit our barn wedding page if you’re interested in renting our barn for your wedding. Call 810-387-4344, call/text 810-388-4970 or email us today to discuss your needs!